Now that Halloween is over and we have just a few weeks to turn our crafty ways towards Thanksgiving, we all should fit in a MOVIE NIGHT! Invite a few friends or just snuggle up with your honey. Below are a few ideas to make the evening extra special. Don't forget you can branch out into the theme of the movie with cookies or food to compliment. If you have the time, put together movie trivia or trivia about the movie's theme and have the prize be related somehow. Also note that your local dollar store has so many great items for movie night like movie box candies and plastic popcorn holders. Ok, I am a cupcake making fool, so I died when I saw these from MarthaStewart.com. 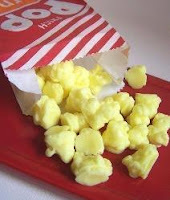 Super easy to make the "popcorn", just take mini-marshmallows and indent an "X" shape across them, everyone will be wowed!